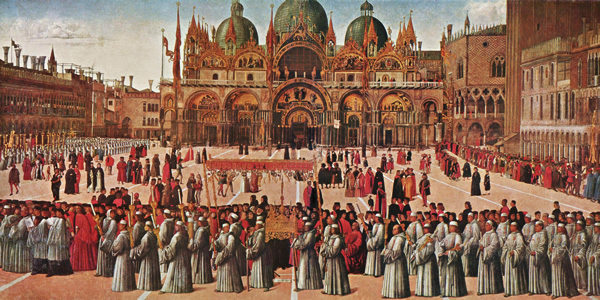 The Procession of the True Cross by Gentile Bellini (1496) is one of many paintings in the Accademia Galleries that showcase just how little Venice has changed over the past 500 years. 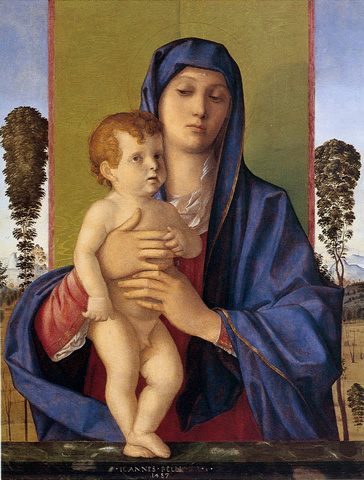 Madonna degli Alberetti by Giovanni Bellini (1487) is one of several classic Bellini Madonna-and-child paintings in the Accademia Galleries. If you only make time for one museum in Venice, make it the Accademia. The collections cover the giants of Venetian painting from the 13th to the 18th centuries, and are housed in the gallery space of Venice's Accademia della Belle Arte (Academy of Fine Arts), established in 1750 in the former Scuola della Carità chapterhouse and convent attached to the (deconsecrated) Santa Maria della Carità church. 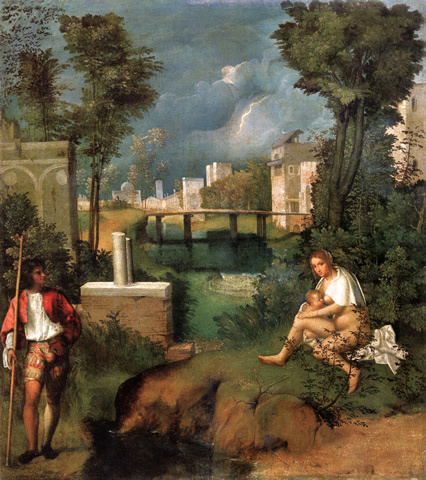 The Tempest by Giorgione (1507/08). Since this is, technically, an art school (its second director was late baroque master of the swirling-heavenly-clouds ceiling fresco, Giambattista Tiepolo), and since art has ben long taught in chronological order, that is how the Accademia is arranged. This means your visit to the galleries starts off in the 14th century with the likes of Paolo Veneziano's Coronation of the Virgin altarpiece, continues through Giorgione's weirdly lit The Tempest, and Giovanni Bellini's many Madonna and Childs, and ends with Carpaccio's intricate Cycle of St. Ursula and Titian's late Pietà. Tintoretto's The Stealing of St. Mark commemorates the Venetian merchants who, in 828, spirited the body of the famed saint and Evangelist away from Alexandria during an era when acquiring bona fide saints was de rigueur for relic hunters and Italy's hyper-competitive maritime capitals competed to see who could steal the best saint then build a cathedral around his bones. 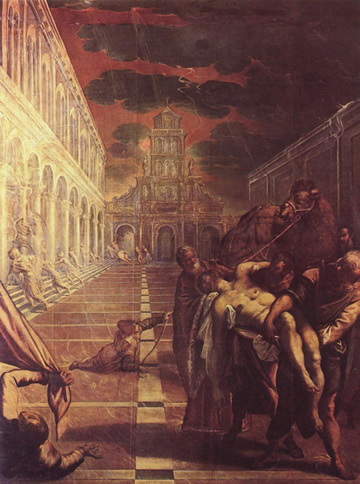 The Tintoretto painting is, obviously, a bit fanciful, depicting the long-dead saint as a fresh, rather muscular corpse being borne in the arms of the Venetian thieves—er, "borrowers." The real story is a bit grislier. 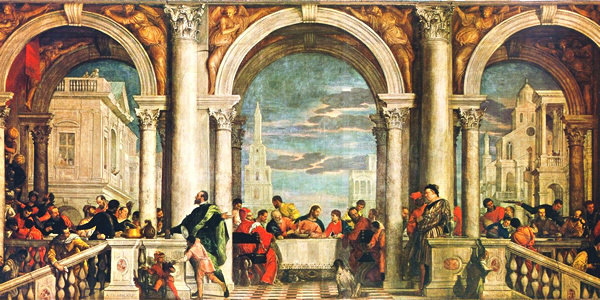 Here's another fun art anecdote at the Accademia: When Paolo Veronese unveiled his enormous painting The Lord's Last Supper in 1573 (pictured below), it was shocking not only for its size (at 42 feet long, one of the largest canvases of the 16th century), but also for its rather racy depiction of our Lord and Savior and his buddies. The artist had portrayed this holiest of moments as a rousing, drunken banquet that resembled paintings of Roman orgies. The rising puritanism of the Inquisition had a conniption, and the church promptly charged the painter with irreverence—and threatened to indict him on the very serious charge of heresy. Veronese quickly re-titled the work Feast in the House of Levi—a scene that still had Jesus in it, but a Jesus surrounded by secular guests who were free to engage in acts of gluttony—and the mollified censors let it pass. Feast in the House of Levi by Paolo Veronese (1573). Planning your day: It'll take you a good 90 minutes to three hours to peruse this vast collection of masterpieces by color-obsessed Venetian artists. Book ahead: Fire regulations mean they limit the number of visitors inside, which can sometimes translate into long waits to get in—especially in summer when you can might wait in line for anywhere from 20 to 45 minutes. That makes it well worth the small fee to reserve your entry time, either by calling the main number (above under "Details") or via www.gallerieaccademia.org or at Select Italy. Audio tours are available for €4; two can save by sharing a tour (with two headsets) for €6. They'll force you to check your daypack—officially only if is it's more than 10x30x15 cm (4x12x6 inches), but in my experience they flag anything larger than a small purse—and charge you €1 for this "service."